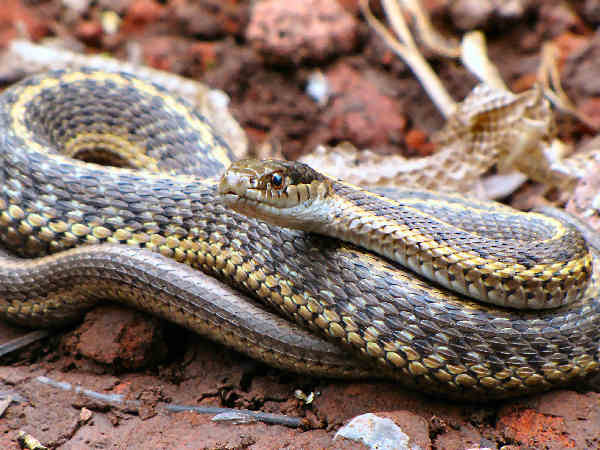 The cooler climate of the Pacific Northwest makes is one of the less snake diverse regions of the United States. Oregon snakes are no exception to that general rule. 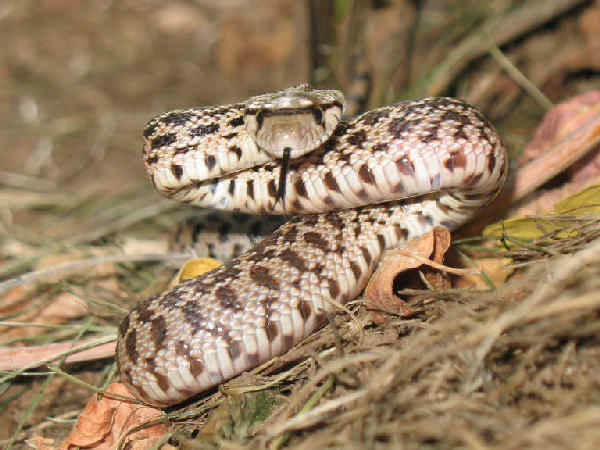 The state’s fifteen snake species also display a regional theme. The Willamette Valley, home to most of the state’s population, and an agriculture center, shows very little snake diversity. 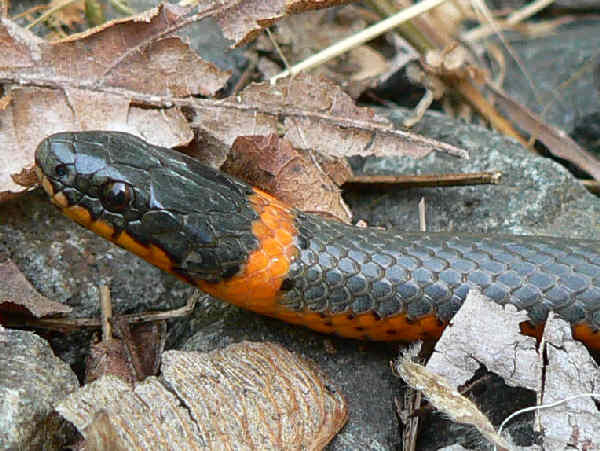 The coastal range on the western border of the valley supports a few additional snake species. The cascades and lands east of them also support a few additional species. Here’s a quick overview of Oregon snakes. Growing up to eight feet long, the snakes with common names such as racers and whipsnaks can be found in all the continental 48 states. Physically they all tend to be long and comparatively thin. Black Racer (Coluber constrictor) is the general name for one of the most widespread of all the snakes native to the United States. In fact eleven different subspecies inhabit almost every state in the lower 48 states. Color is a common name applied to many of the subspecies.. The Western Yellow-bellied Racer is the Oregon subspecies. With the exception of the higher elevations of the Cascades, they inhabit multiple habitat across Oregon. Striped Whipsnakes (Masticophis taeniatus) have a range throughout most Oregon east of the Cascades. There are some questions about whether or not it an be found in the north east corner of the state. California represents home base for both the California King Snake and the California Mountain King Snake. A small population of both species spill over into the Siskiyou Mountains of southern Oregon. 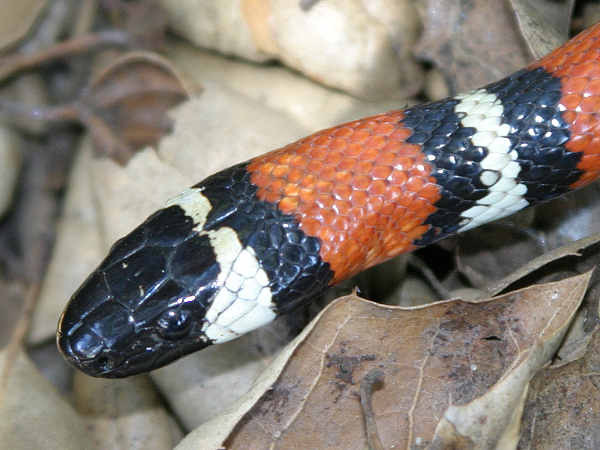 California Mountain Kingsnakes (Lampropeltis zonata) share the black face of the venomous Eastern Coral Snake. 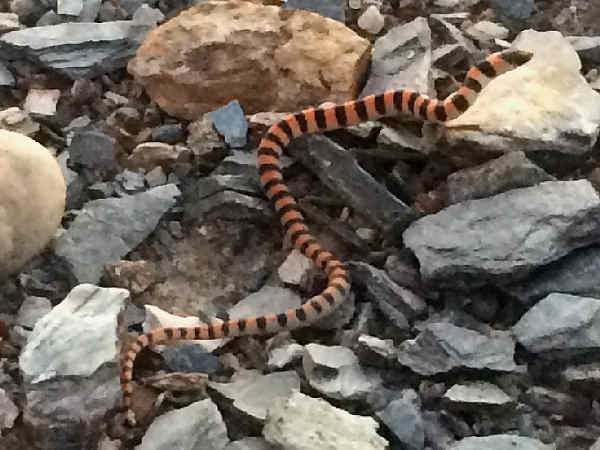 Fear not, in the mountains of California the black face on the banded snake is the key identifying feature of the harmless California Mountain King Snake. 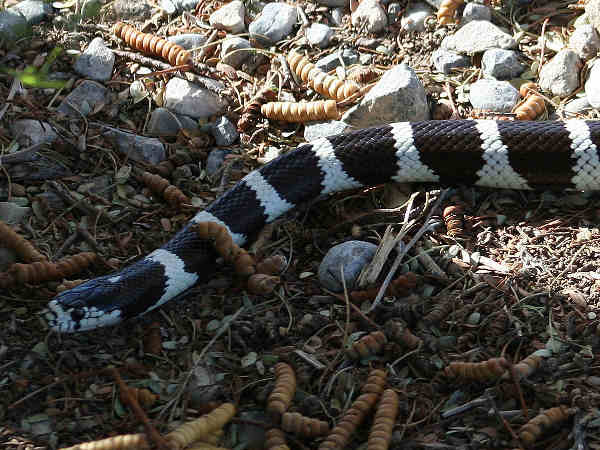 The next pictue shows a black and white species of the California King Snakethat shares some physical characteristics of the Eastern King Snakes. It lives in most areas of California with the exception of the northwest Redwoods area. 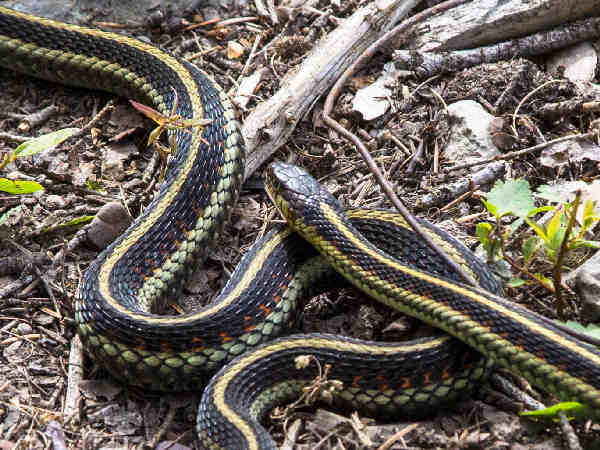 Three different subspecies of the Western Terrestrial Garter Snake (Thamnophis elegans) inhabit western North America. 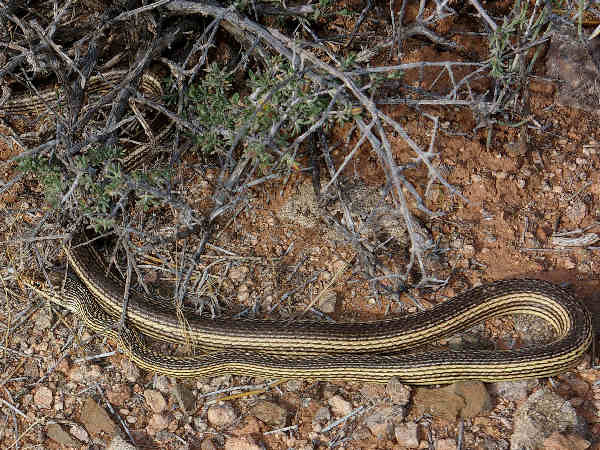 The picture shows a typical wandering garter snake skin pattern, characterized by the light color stripes. A close up picture would show the snake’s eight upper labial scales, typical of all Thamnophis elegans subspecies. Gopher Snakes or Bullsnakes (Pituophis melanoleucus) are one of the most common of Oregon snakes, found both east and west of the Cascades. 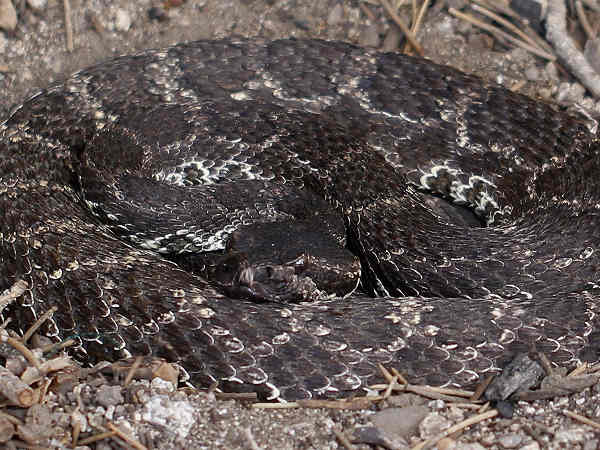 They can grow large and bulky, often resembling rattlesnakes with their brown blotched body. Because of their habit of basking in the sun, it’s sometimes easy to approach them for a definitive identification. It almost goes without saying, look for the rattle. If no rattle, think Bullsnake. Groundsnakes (Sonora semiannulata) rank among the most colorful of Oregon snakes. There is a very small population along the eastern border of the state. 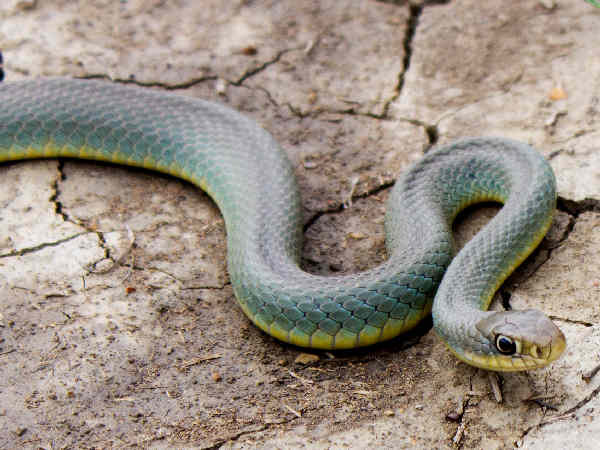 Common Sharp-tailed Snakes (Contia tenuis) are very small snakes, growing to less than a foot in length. They inhabit the coastal range areas. 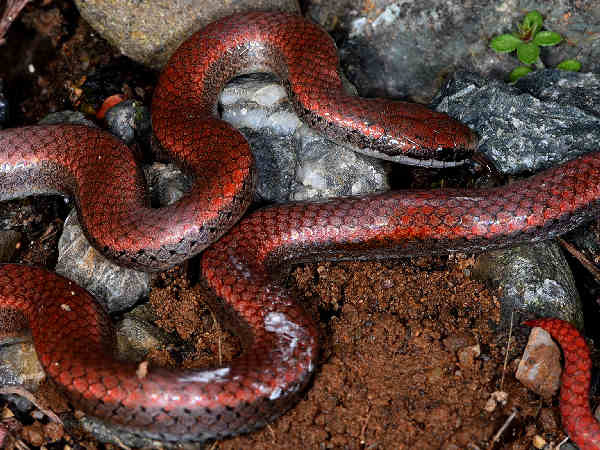 The picture highlights the typical look of the snake, a brick red body with black stripes. The Western Rattlesnake (Crotalus oreganus) wins the title of being the most common rattlesnake species in the Rocky Mountain and Pacific Coast states.